When given a choice, my family will always opt for a hot pound cake right out of the oven. A few years ago, I shared one of my favorite pound cake recipes with you— Jo’s Whipping Cream Pound Cake. Pound cakes have always been popular and are always at the heart of a recipe collection. They are easy for both the beginner baker or the experienced cook, and they are very beautiful when served. We had the most delightful discussion in our office the other day. Is a pound cake a pound cake when it is cooked in a Bundt pan? Or is it a Bundt cake? We all finally concluded that we didn’t know for sure. When I did a little research, there isn’t a specific recipe for a Bundt cake. Any cake can be baked in a Bundt-style pan. Bundt cakes do not conform to a recipe, but merely to the shape of a round decorative pan. Bundt is actually a trademarked name by Nordic Ware who produces many round, artistically formed pans. You can get beautiful pans with fluted edges, castle spires, and many more! I just love them. The pound cake dates back to the 1800s. The name comes from the original recipe that called for one pound each of flour, sugar, eggs, and butter. Wow! You put 4 pounds into this cake before you baked it! Pound cake refers to a recipe. And we bake pound cakes into loaves, round cakes, and I even bake mine in oven-ware dishes. 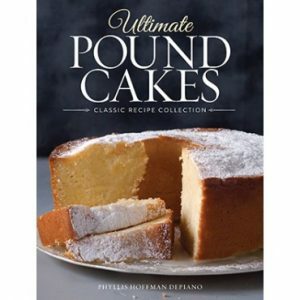 I am so proud of our new book, Ultimate Pound Cakes. It is a collection of our favorite pound cake recipes. Many are cooked in Bundt pans and others in varying size pans. This collection will be a favorite of yours, too. When you need the perfect dessert to serve or to take to a friend, you will find great ones in this book! Featuring more than 100 recipes, Ultimate Pound Cakes gives you a treasure trove of recipes to choose from for years to come. From heirloom recipes to modern variations, these test-kitchen approved, home-baked cakes are the treat for you or your loved ones! Order Ultimate Pound Cakes today for a discounted price of $20 plus shipping! I love this book so much that I’ve decided to release one special recipe for all of you wonderful Ribbon readers! 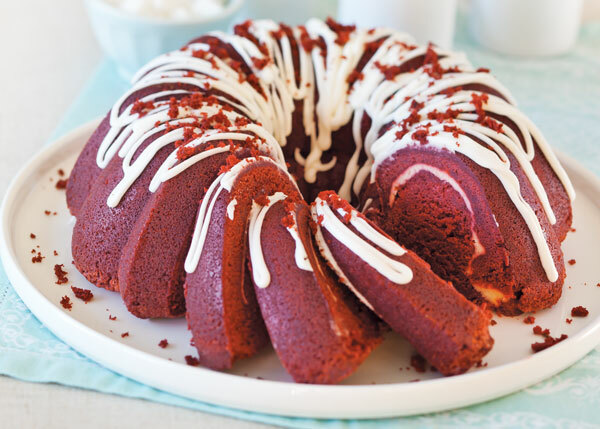 This Cream Cheese-Filled Red Velvet Cake Pound Cake is the perfect dessert for many special occasions! Cake: In a large bowl, beat butter and granulated sugar with a mixer at medium speed until fluffy, 3 to 4 minutes, stopping to scrape sides of bowl. Add eggs, one at a time, beating well after each addition. Beat in vinegar and vanilla. In a medium bowl, combine flour, cocoa, salt, and baking soda. Reduce mixer speed to low. Gradually add flour mixture to butter mixture alternately with buttermilk, beginning and ending with flour mixture, beating just until combined after each addition. Stir in food coloring. Spoon half of batter into prepared pan. Top with Cream Cheese Filling. Spoon remaining batter over filling. In a small bowl, whisk together confectioners’ sugar and cream until smooth. Drizzle over cooled cake, and sprinkle with cake crumbles, if desired. Cover and refrigerate for up to 3 days. In a small bowl, beat cream cheese and sugar with a mixer at medium speed until smooth. Add egg and vanilla, beating until combined. Hurry while supplies last! A treat for you or your Valentine! Thank you Phyllis…I will definitely try the red velvet cake without the food colouring. It sounds absolutely delicious and you are so right…the beets might change the flavour and probably the texture too. Jo’s Whipping Cream Pound Cake is my favorite. I first saw this recipe in one of your first issues of Southern Lady. Thanks for this wonderful recipe. Its my go-to when I need a wonderful cake. I agree with you. Thank you Phyllis. I’m planning on making this cake for dessert Sunday evening. Can hardly wait to taste it! Jo was my mother in law, and we loved her pound cakes! It is still our favorite one to make and enjoy. Thank you for sharing her story in such a sweet way. You had a beautiful mother-in-law that we all loved so much. Her pound cake was a gift from her heart and she shared her baking love with everyone. Thank you Dawn!!! My father used to make the most delicious lemon bundt cakes. I think he was hiding a secret step or ingredient because none of us could ever make them as well as he did. Years ago he also found a recipe for an eggnog poundcake that is out of this world good! It had slivered almonds baked into the top of it. I still have a copy somewhere. Now I feel inspired to look for it. Annie, the eggnog sounds fabulous…..would you share your recipe? I will be happy to as soon as I find it. I found it! I think it originally appeared in either The New York Times or New York Newsday many, many years ago. 2. Generously grease a 10-inch bundt or tube pan with butter. Sprinkle with almonds. Set aside. 3. Sift together flour, salt, and baking powder. 4. Cream butter. Gradually beat in sugar until light and fluffy. Add rum extract, vanilla and eggnog, then flour mixture. Beat at low speed in mixer until all flour is moistened, then beat for 1 minute. 5. Add eggs, 1 at a time, beating 1 minute at low speed after each addition. 6. Turn into prepared pan and bake on lowest oven rack, about 1 hour and 10 minutes, or until cake tester inserted in center comes out clean. 7. Remove from oven and let stand for 10 minutes, then turn onto wire rack to cool completely. May be sprinkled with confectioner’s sugar before serving. Phyllis, I love you and your magazines but you are an evil person. Red velvet filled pound cake sounds incredible. I’m still trying to fulfill my New Year’s resolution to lose weight and eat no sugar until Easter.but I promise that at 12:01 Easter morning, I’m making that cake. Evil………haha absolutely when it comes to cake! I love pound cakes. My mother used to make a delicious honey bundt cake. I’ve never tasted a red velvet cake, because I find the addition of all that red food colouring a little off putting. Does anyone know of any alternative…possibly adding a few cooked , shredded beets instead? Roma the red coloring is at add the red tint only. It adds no flavor so you can make it without the red coloring and the taste will be the same. Beets might change the flavor….not sure about that. I do love beets, but just not sure. Someone on Ribbon may know. One of my son’s favorite cakes. In the recipe for the cake, I don’t see where you add the cream cheese “filling” to the cake. Am I missing something? It will be corrected soon. Thanks for catching the missing steps…..so sorry. Recipe has been corrected…….good to go!!! Thank you again. That pound cake looks delicious. My favorite pound cake is marble. I also like golden pound cake, topped with cream, strawberries,blueberries,bananas and any other fruit that is in season,peaches,etc. 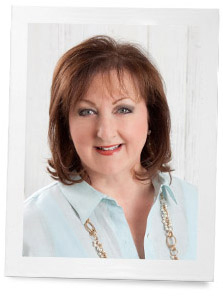 Wishing you success with the pound cake book. I love to eat pound. There are a lot of cakes I cannot eat due to my asthma. I am allergic to chocolate and any nuts. I opt for a golden pound cake that is made without the above mentioned ingredients. God luck with the new book. It is sure to be a winner! Thank you Marion. I am grateful for your encouragement. Phyllis, I can hardly wait for this new book! You are so kind to share a recipe ahead of the book’s release. Looking forward to baking it for my family. For special occasions, I used to bake a pound cake and serve it with fresh strawberries and whipped cream. I thought that was “strawberry shortcake.” Then someone told me I was calling the dessert the wrong thing. What is the difference between shortcake and pound cake? Thank you also for the historic tidbits you pass our way; your blog posts are so interesting and delightful! Martha a shortcake is like a sweetened biscuit. It has the same ingredients but is made more like a biscuit. Google it and you can read the descriptions. That would be a great blog. Thank you for suggesting it. Part of my childhood….shortcake desserts. We also served pound cake with strawberries and whipped cream. Pound cakes are great when you want a light dessert. Congratulations on the book. Thank you Joan. I agree with you completely.